Whether you are looking to create an outdoor retreat or just want a great place to entertain this summer – night and day – backyard transformations can be a blooming a success with tips from one of our Hillermann Gardening Team. Here are 5 fool proof secrets to breathe life into the gardens surrounding your home. 1. 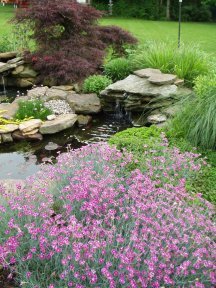 ANNUALS ARE A QUICK FIX—Annuals are the perfect solution for injecting color into an outdoor scene. Look for bold new color choices and consider foliage textures as well. Plant sweeps of color in hues that pop. The ‘sweep’ effect draws the eye across the space and lends an easy feeling for those that enter the garden. 2. FASHION FABULOUS YET FUNCTIONAL CONTAINERS—A great container arrangement adds instant style to patios, porches, walkways and even flower beds. Watch for the vigorous growth habit in plants to add dimension to your containers. 3. FEED THEM AND FORGET THEM—most gardeners do not provide their plants with basic needs like food and water. That is why you should only plant what you can comfortably maintain. Use a slow release fertilizer such as Osmocote, for a long lasting feed program. Along with food, plants need plenty of water, so water well. It’s a mistake to give plants too little water. 4. INVENT DEPTH WITH ILLUSIONS—Adding wow factor to your gardens can be as simple as adding one major feature or a series of mini features. Staggering plants on posts throughout your beds will add a true wow factor. Think vertical with structures and trellises to add yet another effect. 5. ACCESSORIZING THE EXTERIOR—Well-placed accessories like planters, garden ornaments and fountains make all the difference when attempting to upgrade an outdoor style, but selecting and using them appropriately can be a challenge.